Brain scattering techno from one of Melbourne's most relentless live acts. Operating under the radar until now, rare glimpses of Mosam Howieson and his otherworldly live techno have been limited to smoke filled clubs around Melbourne, where his steaming performances are slowly becoming the stuff of legend. 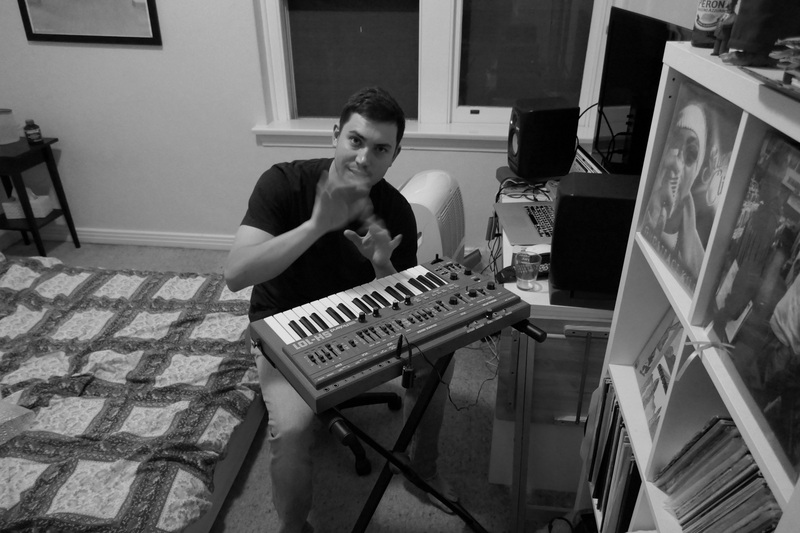 A prodigiously talented artist, Howieson’s heavy ambient excursions were among the first of his growing arsenal to emerge on twelve inch – for equally heavy-weight labels like Seattle’s Further Records and Canada’s Silent Season – before his most recent offering for local institution Butter Sessions moved things up a gear. Complemented by menacing remixes from Sleep D and Japanese techno giant Wata Igarashi, the latest piece of the Mosam Howieson puzzle is a subwoofer testing, alien-like techno masterpiece primed for peak time assault, and perhaps a sign of things to come from the mysterious Melbournian. We stepped into the office of the man behind the machines, and he’s delivered the first ever recording of his live act, packed full of new and forthcoming heat. Hey Mos, how’s things? What have you been up to? Working lots, just did the record launch party for my new EP on Butter Sessions which was really great. Doing a new remix, some records and forever working on the live set. You’ve managed to keep a pretty low profile up until now, tell us about how the Mosam Howieson project came about, and what have been some of the major influences on the kind of techno you’ve become known for producing? The project is a realisation of years of hard work and finally finding the confidence to do what I wanted in music. I don’t even consciously think about making ‘techno’, however it comes out is how it comes out. I know you’ve also had a pretty serious passion for hip hop from a young age, what can you tell us about that, and how important has this been for you as a kind of release or a place to find new inspiration? Hip Hop is what I listen to at home most of the time. It’s so broad now I would struggle to make sweeping generalisations, but as far as what I listen too, there is a driving grit, soul, aggressiveness and lyrical depth. I find inspiration from the DIY Hip Hop culture, it reminds you anyone with the work ethos and talent can make great records from the bedroom. So many of the classic beats were made by young people in home studios on MPCs/SP 1200’s etc. You’ve released on a bunch of great labels like Further Records, Silent Season and now Melbourne’s finest Butter Sessions, tell us about those tracks and how they came about.. the title track with its sci fi elements and monstrous strings sounds like the most Detroit influenced thing you’ve done, was that the general idea? I wrote the A side at least four years ago. I spent a lot of money buying new equipment and needed to justify that purchase, so I made a record restricting myself to only the new gear (SH-101, 303 and MFB-552). The sci fi elements came later and just seemed to fit the mood of the record. As far as the Detroit influence; I was listening to Derrick May – Innovator at the time. In ‘Icon (Montage Mix)’ he has these moving low chords and huge high strings playing over the top with the crazy pitch bend etc. I had already done the rest of the track and thought I would try and and add something like that. My friend Rich, a great musician, came over and jammed out the high strings bit in one take after I told him how I wanted it. Brain Scatter was written maybe three years after, but as soon as I finished it I knew it would fit perfectly with Napalm (Romance). The Butter Sessions EP also comes with two quite different remixes… a slower industrial EBM style mix from label heads Sleep D and steaming broken techno number from Japanese master Wata Igarashi.. how did that come about? Is Wata someone you’ve always wanted to collaborate with? I’d been talking for years with the Butter Sessions guys about doing a record (besides my contribution to Domestic Documents), and I guess it was always the plan for them to remix one of my songs. There was no discussion at all about direction, I just let them do whatever they wanted. They surprised me with that remix in the best possible way, I hadn’t heard anything that menacing from them before, it’s dope. I had noticed on the Further Records bandcamp page that Wata Igarashi had purchased the Spirals release. I used that as a reason to connect with him, turns out he really loved that record and we have been exchanging music and talking ever since. He played one of my (at the time) unreleased Silent Season records on his XLR8R podcast and I always had it in the back of my mind that I would ask him to remix my next project. Obviously that project turned out to be the Butter Sessions record! And yes he is one of my favourite producers, I still kind of can’t believe I got him to do it. I know you’ve been working on a new live set for quite some time, which you’re debuting for the first time here for us. Tell us about the new setup and what you’ve come up with for this recording? This live set is a mixture of what you would hear me do for a club set and what you would hear me doing at home in the studio or for an ambient set. It’s not so much a new equipment set up as it is a different way of performing and giving me greater ‘live’ control over all the elements. Also shouts to L’estasi Dell’oro and Sadie LaPierre for the amazing vocal sample early in the mix. What else is coming up? I hear you’ll be playing a few live dates in Europe later in the year, what can you tell us about all that? I’ll be bringing the live show over to Europe in September starting at the Meakusma Festival in Belgium followed by a few more dates TBC. I have a remix coming for Pugilist for Melbourne label Modern Hypnosis and a release on one of my all time favourite European labels set for later in the year, which I can’t reveal just yet..
I’ll also be DJing this Friday at The Sub Club here in Melbourne next to Woz, Pickleman, Pugilist and Stormn Normn.